The Grant Academy is a private school that specializes in meeting the needs of students with learning disabilities, ADHD, and autism. 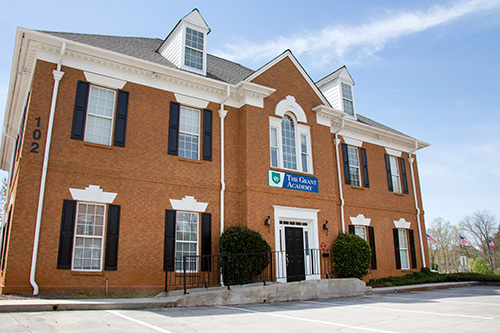 The Grant Academy accepts Georgia Special Needs Scholarships. We educate students 1st through 6th grade. The Grant Academy was started by educators who felt that the students with special needs of Cherokee County deserved another option. There are many students that were falling through the cracks and we feel that these students’ would thrive in the right environment. Our belief is that all students can learn, but some learn in different ways. We utilize a whole brain approach to learning to help optimize their learning experience. Students are taught to think for themselves and become global learners. The Grant Academy meets the students where they are functioning and helps them achieve all that they can achieve. All of our teachers are certified in special education. Our teachers all have experience and a passion for teaching. We believe in a team approach where everyone works together to help students reach their goals. In the right environment, students will achieve more success. The Grant Academy provides smaller classes in a warm and nurturing environment. All teachers are highly qualified teachers who are certified in special education and have experience working with this population. The teachers make adaptations in the environment to help students be more successful. All students can learn, some students just need to learn in different ways. We use a whole brain approach to learning so all types of learners experience success. The lesson plans are guided by Individualized Education Plans (IEP) and are developed with the belief that it takes a whole community to educate students. Parents, teachers, and students need to work together to help students’ achieve their academic and social goals. Why Choose The Grant Academy? The class sizes are smaller. We provide a warm and nurturing environment. We utilize a whole brain approach to learning which allows all students to achieve at the highest possible level. All teachers are certified in special education and have experience in the field. The teachers work together in a cross-discipline approach to maximize learning. We update the IEP’s with the progress report cards instead of yearly to ensure that the plans meet the ever changing needs of the students. We provide more project learning opportunities which promote a deeper understanding of the lessons. We have monthly educational field trips and speakers so students can experience learning. Social skills and life skills are an integral part of the curriculum. The Grant Academy will provide a nurturing environment that encourages the development of skills for success in life. Teachers will teach academic skills and will adapt the curriculum to meet the needs of students. Teachers will use a whole brain approach to learning to address all types of learning styles. Students will develop critical thinking skills needed in life. Students will learn the social skills needed to be successful. Students will be given the opportunity to explore area of growth in the classroom and beyond the academic classroom. Teachers will give opportunities to students to apply learning in different context for full understanding of concepts. The students will be involved in community activities that promote academic, social, and moral learning. Students will be exposed to fine arts, music, theater, and sports. Teachers will encourage career exploration that is appropriate for the students. Teachers, students, and parents will work together to help students achieve more success.